There are two periods of time during which you could consider visiting your outsourcing team. The first would be during the selection process, and the second is after the selection, once you have started working with your outsourcing team. There are numerous benefits in meeting the outsourcing team during the selection process itself. Namely, that it enables you to build a mutual understanding and trust between your company and the team you are hoping to select. Meeting the team in person will ensure a long term commitment between both parties, and allow for a sharing of common goals. It will also help for both teams to get to learn about each other’s cultures and to eradicate any preconceived ideas about how each other plans to operate. Meeting with your team will help you to understand and evaluate us, in person, at Orient Software. You will be able to see first-hand our team’s capabilities and strengths. It will enable you to meet your people, and learn more about our company culture, our working style and our employment of the Scrum project methodology. Long distance paperwork can become quite tedious, and meeting with your team in person during the selection process will no doubt boost the entire decision making process for you and your company. However, there are also many benefits of coming through to meet your outsourcing team after you have made your selection and have begun working with us. Again, it will allow you to build a mutual understanding and trust between our company and yours, and making the effort to come through to our premises will indeed reinforce the notion of a long term commitment and successful working relationship. Meeting us will help you to get a sound understanding of the project and team, and after working with the team on the ground for a few days, it will allow you to make a succinct overall evaluation of us and gain a better overall understanding of how we operate. Most importantly, when you come through to our offices and meet with us, it will allow for you to get to know us better, on a personal level. Through this team building element, both of our teams will be motivated to better work together, and getting to know each other on a personal level will alleviate any cultural or personal gaps that may have arisen. Not only is it beneficial for your staff to come through and visit us at Orient, it is also greatly beneficial for our own staff when you make the effort to come through to us. Your visit will help our staff better understand your business, and by doing so, it allows for us to make a better evaluation of your projects requirements so that we can deliver the best possible outcomes. Face to face communication allows for our staff to fully understand your company’s long terms strategies, and in doing so, facilitates the team to follow the correct steps and procedures to adhere to your desired direction and goals. Furthermore, this meeting allows for our staff to simply learn more about your business, and better themselves as a development team overall. Meeting with new companies allows for us all to learn something new and exciting. It gives the necessary space for us to all share our new technologies and solutions, and to discover what new trends are emerging worldwide. Some of our clients make regular visits to Orient a few times a year, while others opt to visit us once per year during the project. Each company chooses who they feel would most benefit from the trip. Sometimes coming as just one key engineer, a technical team, or even a small, ten man company may come through. Each company decides how long they wish to stay with us. Sometimes their visit may last up to a week or two, but some have even stayed with us for several months. 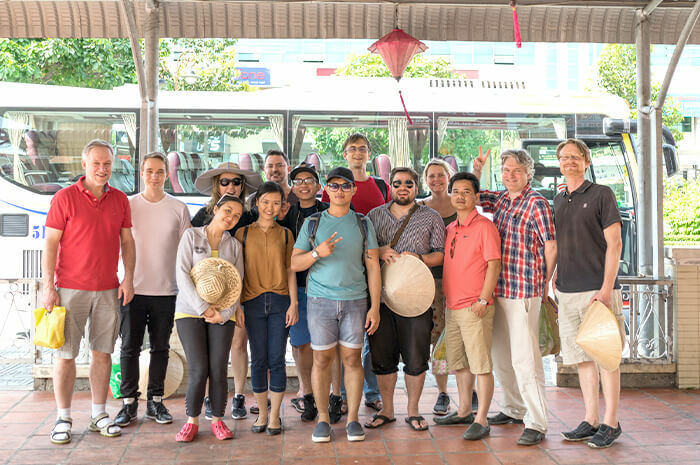 Apart from the obvious business and technical meetings which occur during these visits, clients are also given the opportunities to visit the team member’s places, and are even given time to do some sight-seeing around the city, and of course to enjoy the ample Vietnamese cuisine. Taking a business trip to visit your outsourcing team brings your company several benefits and business solutions. We at Orient Software are looking for and really appreciate long-term partnerships with all of our clients. Some of our clients have been working with us for 10 years, and have been expanding their business needs with us from one service to several services during that period. Our clients are especially impressed with our staff’s skills, our knowledge, and most importantly our dedication to every project. Feedback from our employees shows that they spend 80% of their working hours communicating with clients, and most of our staff feel very strongly about engaging with the clients’ contact points (such as engineers, technical leads and product owners) in order to uncover project solutions. Beyond all the technical and work related communication, outsourcing at Orient allows for our client’s staff and our internal staff to build up international working relationships and friendships. Orient Software's professional design and development team builds high-quality solutions for clients all over the world.